Because of expired products are no longer effective products, Beauty Bag Tracker is the tool you need. 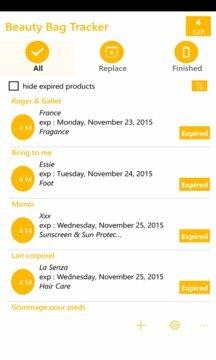 Beauty Bag Tracker is an elegant application, easy to use, acessible that tracks expiration dates of your cosmetics, and alert you when it comes time to replace them. It's the best way to keep track of your collection of cosmetics. Manage your stock of personal beauty products using the many categories and sub-categories, which proposes the application. The application reminds you of the remaining time that the product is safe to use after opening. 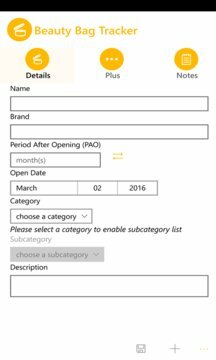 Many options are available for your products as a list of your products to replace, automatic reminder defined by you, a personalized shopping list to add your expired products. The application will notify you when a product will expire. The application also lets you know when an expired product.